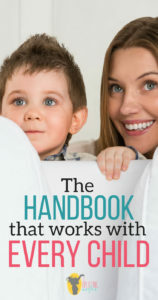 Have you ever thought to yourself, “I wish my kid came with a handbook.”? My husband and I have mentioned this many times throughout the phases of our boys lives. If only….right? As a mom of 5 boys, I have come to realize that each one of my boys are different. There is not one perfect way to raise them all. I have one boy who loves to hug and one who doesn’t like to be touched. One trick may work for one, and not even phase another. There has been many times when I have no clue what to do, or how to handle a certain situation. Our society tends to go straight to google hoping to find an answer, or straight to amazon to find the best parenting book. I personally like to pick the minds of seasoned moms who have been through it. If you would rather download and listen to a podcast on this subject, scroll to the bottom and you will see where you can do that. BOOM! Moms do you realize how special and powerful this quote is? The other day I was praying for wisdom to know what to say to my boys, and when to say it. There are times when I find myself stumbling over words, not quite sure what to say or how to help. This added wisdom had been in my prayers for about a week. At that moment in my prayer it dawned on me, my prayers had been answered. Specific moments came to my mind when I thought to myself, “DANG that was good! or, “Wow that sounded like I knew exactly what I was talking about!” I quickly realized that those bright shining mommy moments had not come from me. I had prayed for increased wisdom, and I had been blessed to know what to say. Our children come with a handbook. Our Heavenly Father is that handbook, but we have to be the one to ask specific questions. Just like when we ask google a question. We try to be as specific as possible to find the most accurate answer. Here are some examples of general questions vs specific questions. I remember in my own home growing up, my parents would pray for each one of my brothers and sisters. It was no easy task considering there were 8 of us. The prayer only got longer when by siblings married and had kids. Even though we had some loooonnnnggg prayers, whenever they got to me I felt their love. I felt a special connection just through their prayers. They prayed for specific things I was going through in school, sports or life in general. Talking with my mother recently, my parents still continue to pray for each child, spouse, and grandchild, individually by name. There are 60+ family members now and over a 2 month period my parents pray for each one of them individually by name. Even though we are all grown, the prayers of my righteous mother and father continue to be a powerful force. Not only in my life, but the life of my husband and my boys. Some of my most profound experiences as a mother has been, when I prayed for specifics. It is a humbling and growing experience each time. Many times you may not realize your prayers are being answered. They come softly and quietly, and many times it’s simply a thought that fills your mind.